I used to be scathing about storytelling for adults as a genre, perceiving it as all a bit too overstated and ‘hey nonny nonny’ for my taste. Then I encountered the brilliant ‘intercultural’ storyteller Vayu Naidu and had a road-to-Damascus revelation that just like any other mode of performance in the right hands, it can be intelligent, subtle and engrossing. Clod Ensemble avoid the term ‘storytelling’ in publicity for The Red Chair perhaps because my pre-Vayu Naidu response to this form is not uncommon. Equally, it may be that this show simply reflects a broader move in much UK performance towards a stripped back style that focuses attention on the performer but in a fashion that also moves away from the sort of rejection of narrative that has dominated this field for the last twenty odd years. On this point it has to be said that much storytelling tends to be at least partly improvised in the moment, whilst The Red Chair has clearly been scripted. 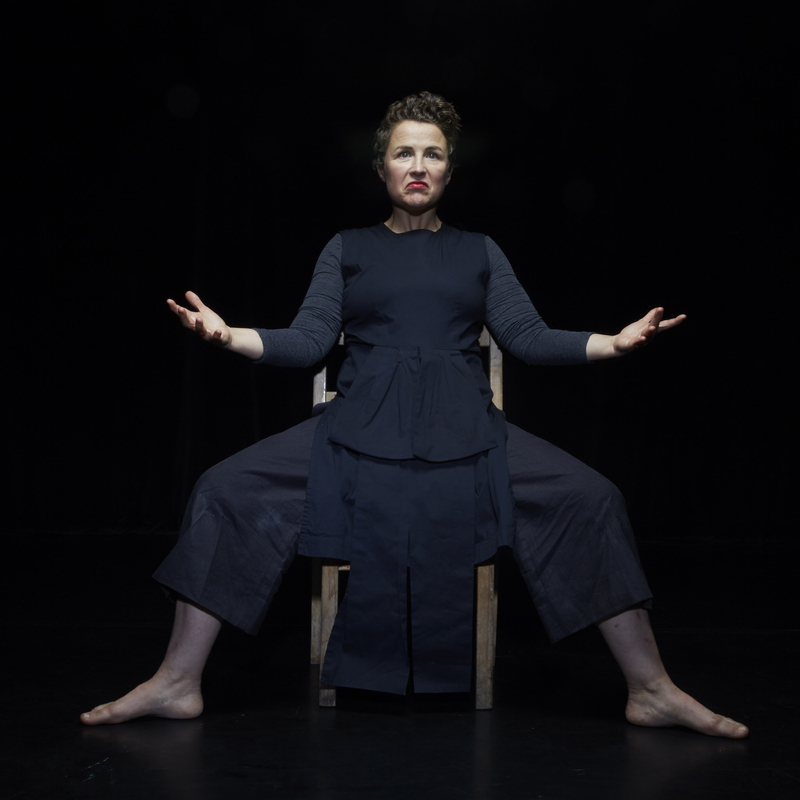 Either way, however it may or may not be categorised, in this solo performance by Sarah Cameron of something described as ‘a cross between Grimm’s fairytales, an absurdist ghost story and a parents guide on how not to bring up children’, the audience are from start to finish, absolutely in the right hands. There are the elements that anyone familiar with Clod Ensemble’s consistently high quality and quietly innovative productions will expect. These include a powerful and haunting score by Paul Clark, precise, evocative lighting (in this case designed by Hansjorg Schmidt) and above all, the unmistakable stamp of Suzy Wilson’s meticulous, sensitive and imaginative directing; all of which frames and supports an astonishing, virtuoso performance from Cameron. This virtuosity is physical, verbal and equally lays in the feat of memory involved in memorising the long, densely detailed and richly baroque script. This tells of a father who has a strange and unhealthy relationship with a red chair and with food (which allows for Cameron to recite long, tongue twisting lists of the various dishes he consumes that are a show in themselves), his wife who is trapped by his obsessions and their ‘inveesible daughter’ Queenie. Actually in the end this turns out really to be Queenie’s story and overall this is a tale of more than one transformation. Echoing this, as well as showing us these three characters and the changes they undergo, Cameron is always on the point of transforming fluid gestures into dance and rhythmical articulation into song and in a way that also blurs the distinction between moving and speaking, dancing and song. Much of this affect and core to the charm of this performance (which does temporarily slip seamlessly into song half way through) relates to Cameron’s use of a Scottish dialect. Peppered with unfamiliar but deeply resonant terms and with its expressive stretched vowel sounds and distinctive melodic rhymes, this is the prefect vehicle for a piece that plays upon the way that words have the power to create worlds that are close to home yet profoundly unheimlich, wholly imaginary yet somehow concrete and tangible. This playing on the senses is enhanced by the fragments of food (a bit of cake, a date, a truffle) and the small glass of whiskey that are served as part of the show and which reflect the theme of gluttony but also recall the historical link between formal storytelling, feasting and hospitality. Significantly If I keep returning to the idea of this piece as ‘storytelling’ it is because at one or two moments during the performance I had a keen sense of my own connection to audiences for this form reaching back into history; all of us sitting in on the edge of the dark, listening to a story being given light and fire and life through the quicksilver skills of someone like Cameron.